The Reflection of Me in my Granddaughter!! 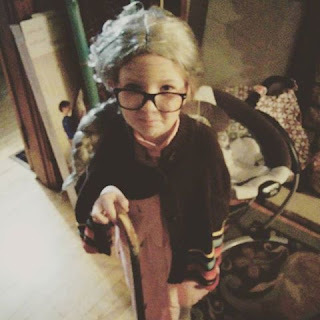 envisions me as an old lady, when truly I feel as young as her 8 year old heart! But it also gives me pause that she is watching us, as children do, and with exaggeration mimics me. It should scare us all, as we show our actions and make comments in front of children! Are we setting an example of who we want them to think we are or would want them to become? It made me wonder, as I looked at this picture of Lucy, what were her actions? Did she love on her baby dolls, or was she too busy to take time for them? Was she pretending to enjoy life or was she a grumpy old lady? (I do think I see a little pucker of a smile on her face!) So many thoughts of how do I show love, to family and friends, and do they know how much I love them from my actions? It reminded me of Mary and Martha when Jesus was confronted by Martha about Mary not helping her with work. The scriptures does not say what Martha was doing, but we do know that she was hosting Jesus at her home. I cannot imagine what I would be doing if I was hosting Jesus!! Sometimes when my grandchildren come, I get busy cooking and preparing for them and maybe I do this too much while they are here. I have just recently started to relax and know that nothing is perfect anyway, so why not enjoy their presence and the time we are together. So many families get caught up in busyness they forget to enjoy the 'reunion' of each other. We always have family times together and we include talent shows by each family, cooking classes, game night with the children and just play time together. Each of these are filled with laughter and more laughter as the children see the adults enjoying themselves. We have a glass sliding door to our lanai and we closed it one night when the children were getting loud outside playing games. The very next night, the adults were playing a game and the children came and shouted through the doorway, "Y'all are entirely too loud!" and proceeded to close the door! Yes, they do imitate us! My heart is filled with peace and joy as I grow old watching the children. Maybe I am getting sentimental, but there is not greater love than God and family. Hopefully, I will grow old with them and get to watch them for many more years, so I ask God for three things. One, that I not grow to be a bitter old woman, but one who enjoys life to the fullest. Two, that my brain will keep up with my body and my memory will last. Three, that my body will keep up with my brain and will not grow weary, but continue to serve Him the best I can as I can. Well, one more thing should be added, that the children who watch me, will see God's love and want to share that love. What more could one ask for in this life? 18 “Imprint these words of mine on your hearts and minds, bind them as a sign on your hands, and let them be a symbol[d] on your foreheads. [e]19 Teach them to your children, talking about them when you sit in your house and when you walk along the road, when you lie down and when you get up. 20 Write them on the doorposts of your house and on your gates, 21 so that as long as the heavens are above the earth, your days and those of your children may be many in the land the Lord swore to give your fathers.